Carlos Soto-Román is a pharmacist, poet, and translator. He holds a Master of Bioethics from the University of Pennsylvania. In Chile, he has published: La Marcha de los Quiltros (1999), Haikú Minero (2007) and Cambio y Fuera (2009). In the United States: Philadelphia’s Notebooks (Otoliths, 2011), Chile Project: [Re-Classified] (Gauss PDF, 2013), The Exit Strategy (Belladonna, 2014) and Alternative Set of Procedures (Corollary Press, 2014). His work can be found in Crux Desperationis, Summer’s Stock, P-Queue, Capitalism Nature Socialism, Where Eagles Dare, Mandorla, Asphodel, Hold and The American Poetry Review. He is a MacDowell Fellow and has been awarded with scholarships from the Chilean Council for Culture and the Arts. 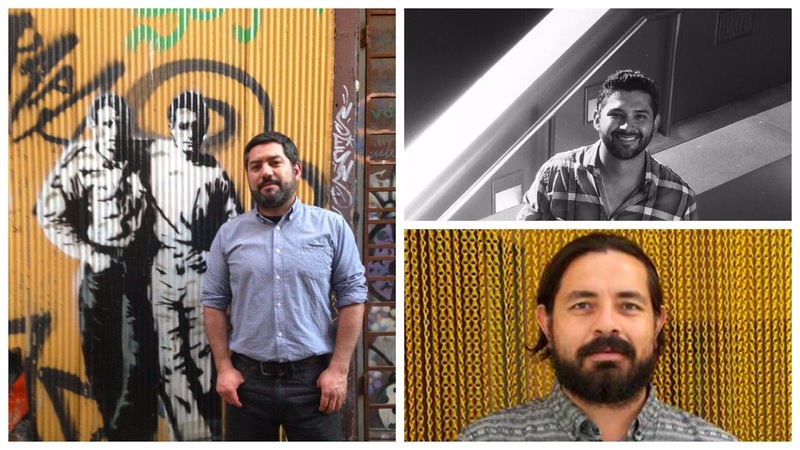 Omar Pimienta is an interdisciplinary artist and writer who lives and works in the San Diego / Tijuana border region. His artistic practice examines questions of identity, trans-nationality, emergency poetics, sociopolitical landscapes and memory. He received his MFA in Visual Arts from the University of California, San Diego in 2010 and he is currently a PhD candidate of Literature at UCSD. His work has been presented in galleries, museums and cultural centers in U.S, México, Germany, Spain, Argentina, Colombia, Chile, Germany and Denmark. He has published three books of poetry, including Escribo desde Aquí for which he has been awarded the Emilio Prado 10th International Publication prize from the Centro Cultural Generación del 27 Malaga Spain in 2009. Román Luján, a Mexican poet and literary translator based in Los Angeles, is the author of Instrucciones para hacerse el valiente (2000), Aspa Viento (2003, artist book in collaboration with painter Jordi Boldó), Deshuesadero (2006) and Drâstel (2010). Coeditor of two anthologies of Mexican poetry, his work has appeared in Zur Dos: Última poesía latinoamericana (2004) and Malditos Latinos, Malditos Sudacas: Poesía Iberoamericana Made in USA (2009) among other anthologies. Translations of his poetry have appeared in Jacket2, Aufgabe, Mandorla, Crux Desperationis and Matter, among other journals. He is a Ph.D. candidate at the University of California, Los Angeles. Rock and Roll Montessori School - Early Childhood Education for Infants, Todders, and Preschool In Cambridge, Boston, & Somerville provides the best infant, toddler, and preschool education in Boston, Cambridge, Arlington, Somerville, MA. Call now for Early Childhood Education. Awesome sharing, really interesting post, keep sharing stuff like this. slither.io | wings.io | happy wheels | abcya| happy wheels the game free | tetris | pokemon go to play for free!